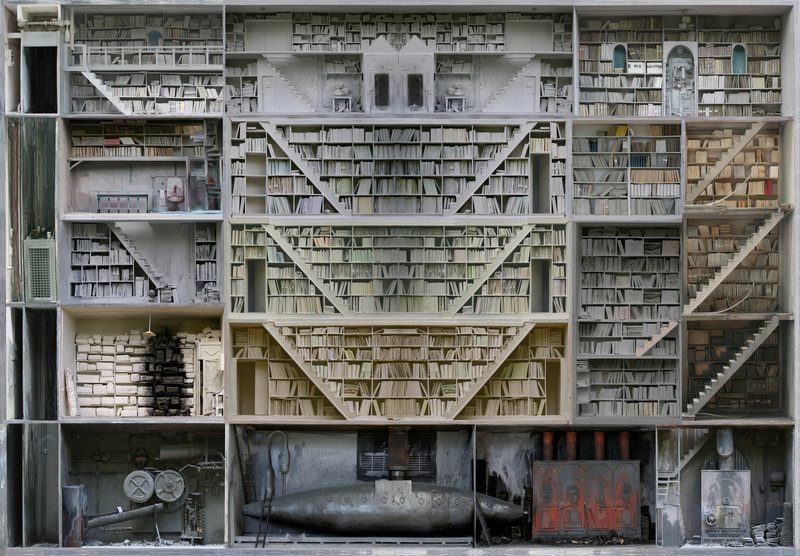 Matej Krén, Scanner (2010): An installation that makes entire buildings out of books. 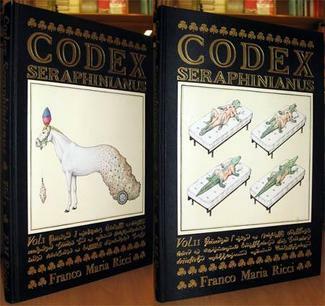 Jonathan Safran Foer, Tree of Codes (2010): A novel that cuts certain words out of Bruno Schulz's Street of Crocodiles. 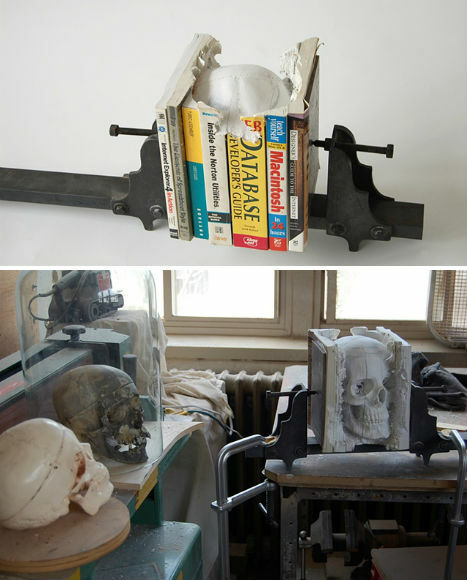 Robert The, Book Works (2000s): The artist makes several sculptures out of books. 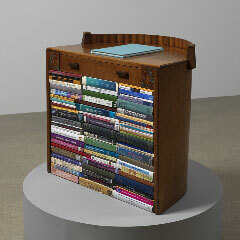 Mike Stilkey, Slightly All the Time (2008): The artist paints folk-art murals on books stacked against the gallery wall. 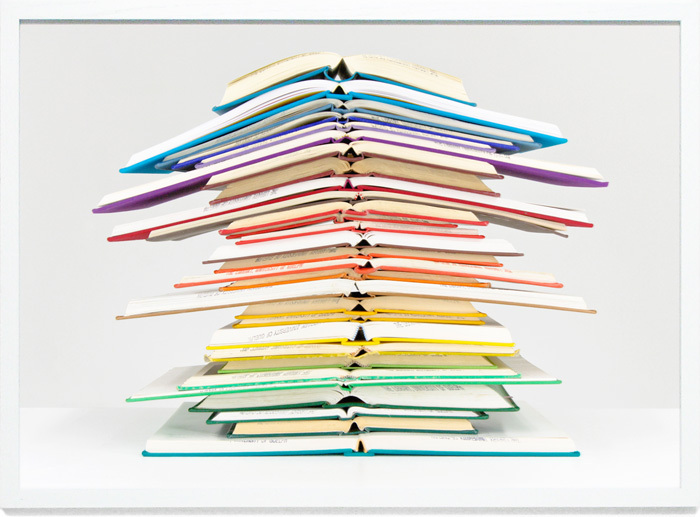 Su Blackwell, Book Sculptures (2000s): She creates pop-up book aesthetic by cutting out designs from the pages and folding them upwards so they become sculptural. 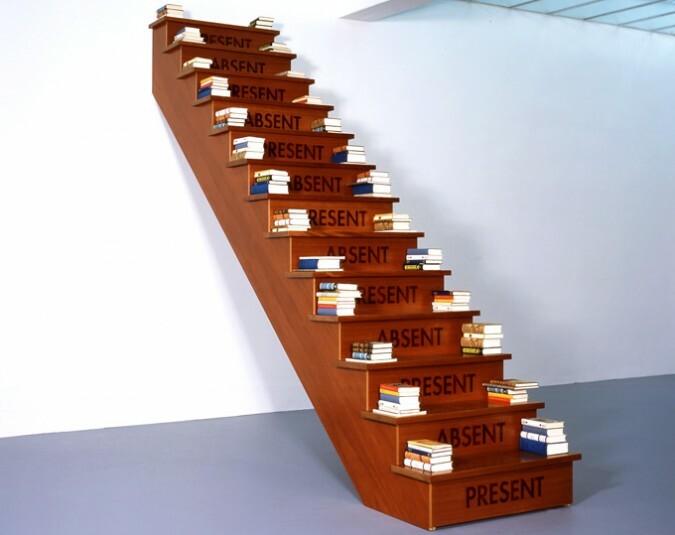 Tom Bendtsen, Argument #2 (1997): Another artist who creates installations by stacking books. 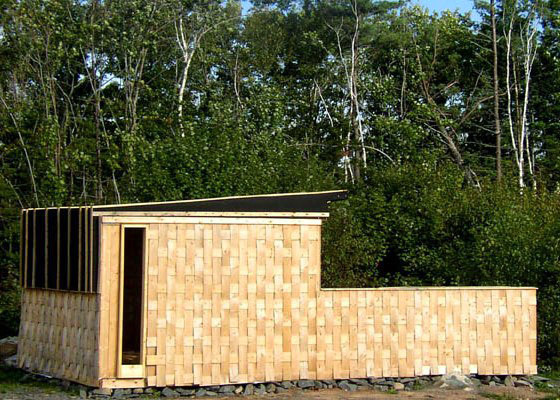 Richard Kroeker and Dalhousie University Department of Architecture, Ambient Material (2010): Architecture made from 7,000 recycled phone books. 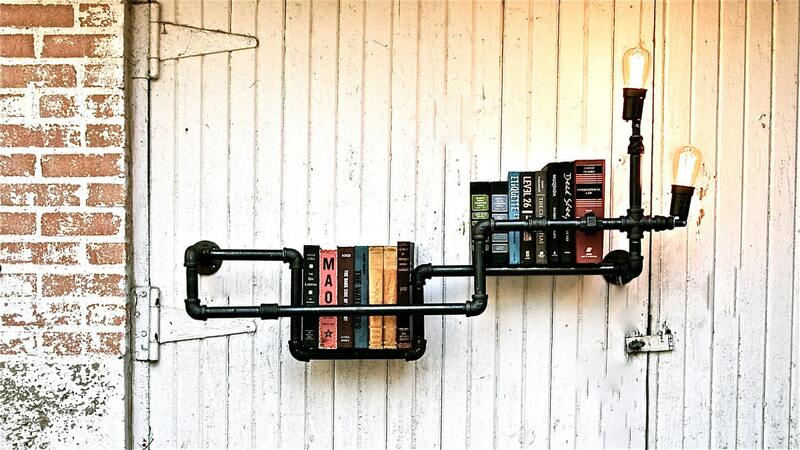 stellableudesigns, Bookshelf Industrial Pipe with Lighting (2000s): part of the Possum Belly Pipe Designs. 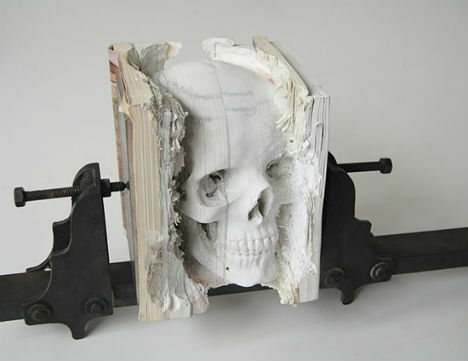 Technically, design, not institutional art, but still too cool to exlude. 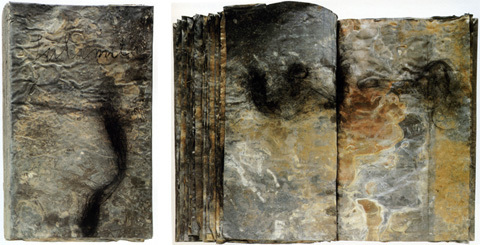 Brian Dettmer, Cooling and Air(2006): Creates stunning altered books that with quasi-cubist compisitions, remniscent of early 20th century artists such as Picasso and Braque, Hannah Hoch and John Heartfied, Joseph Cornell, Romare Bearden, El Lissitzky, etc. 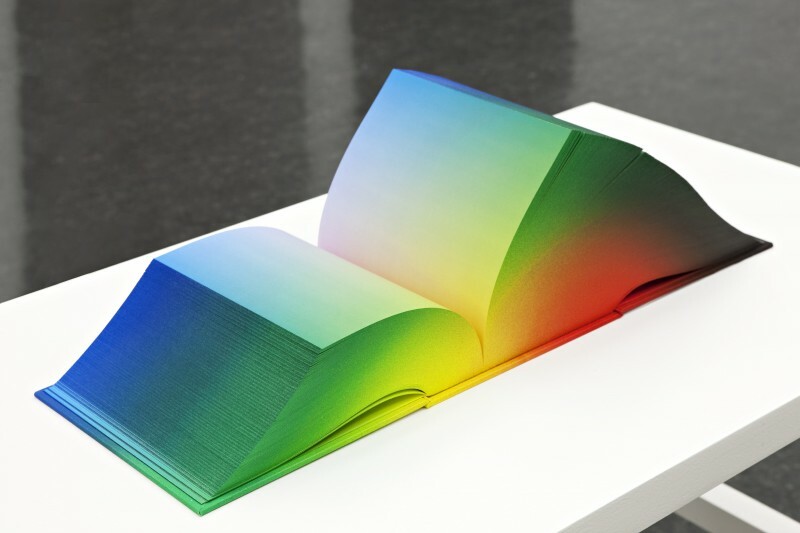 Ruben Aubrecht, A Picture (2004): deconstructs a digital photo split in its information contents, the source code (253 pages). 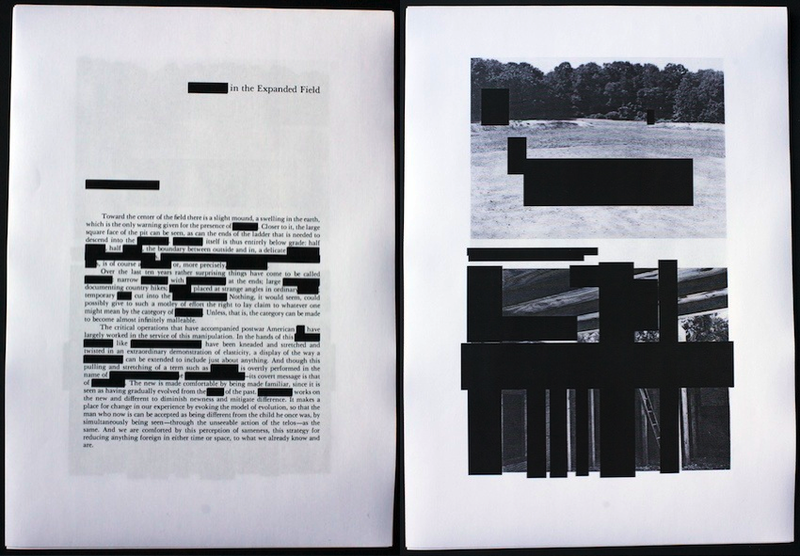 Martijn Hendriks, XXXXXXXXX IN THE EXPANDED FIELD (2008): Downloaded copy of Rosalind Krauss’ essay "Sculpture in the Expanded Field" from which all references to art were removed using standard methods of redaction. Redistributed pdf, unlimited laser prints. 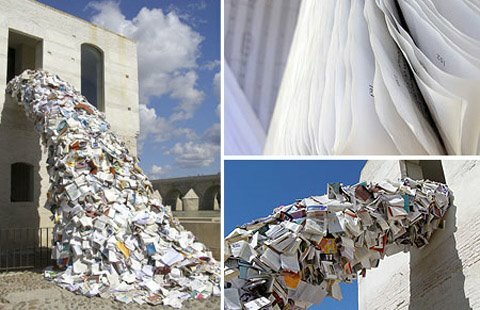 Team Wuzhuyi: A group of 24 experimental poets in China altered books and planned to shopdrop 12,000 copies of 24 poems in stores, bookshops and shopping malls throughout Beijing during the Olympics. The general theme was “Olympics-related poetry” that avoided the usual propaganda. While their original site has disappeared this blog (not in English) includes information and images. 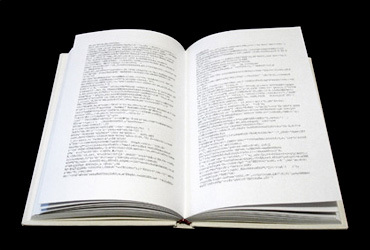 Free Words: a book which belongs to whoever finds it. 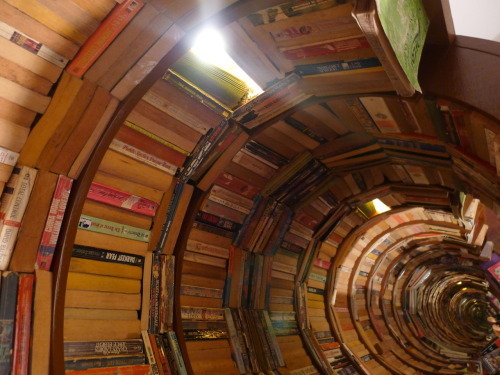 The books are placed on the shelves of bookstores and libraries creating an art situation that infiltrates public and commercial space. 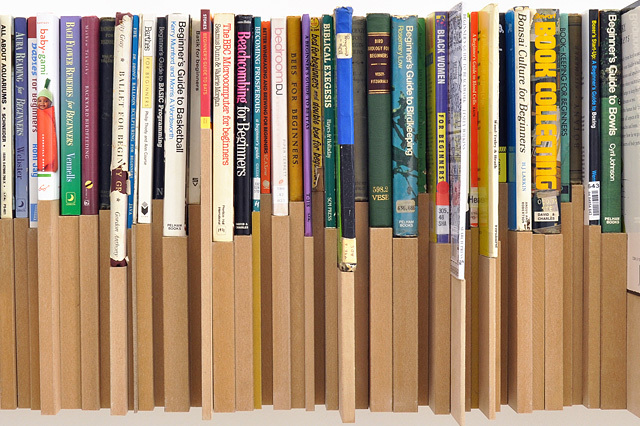 Blake Lee, Post-It-Books (2010 ongoing series): artist Blake Lee draws stories on sticky notes and places them in library books. 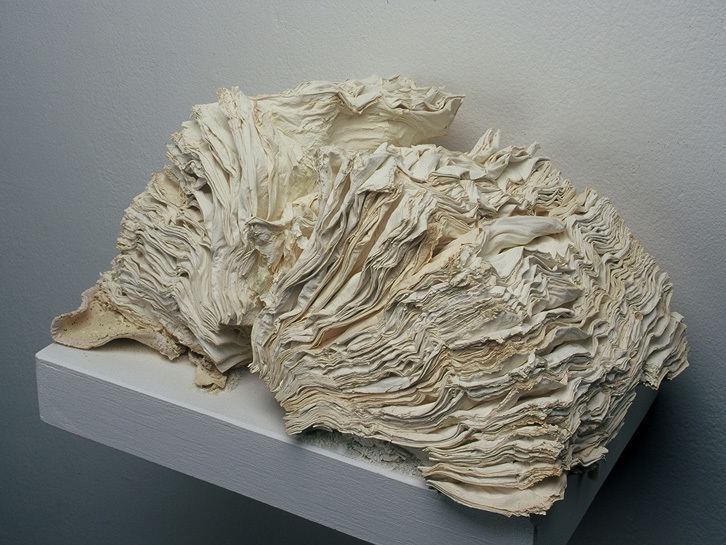 Milan Knížák, Jan Mach, Sonia Švecová, untitled (c. 1965): "Knížák cofounded the Group AKTUAL with artists Jan Mach, Vit Mach, Švecová, and Trtilek in 1964. Robert Wittmann joined the group a little later that year. They protested the bankruptcy of Soviet-imposed socialist culture in Czechoslovakia. Their 'demonstrations' took the form of mock war games, street actions, and other events that included the destruction of art objects (musical instruments, paintings, and sculpture). Knížák understood these performative events to be an affirmative alternative to the repressive experience of communism. 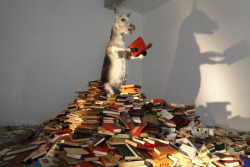 His work and the 'ceremones' of the Group AKTUAL were embraced by artists involved in happenings and Fluxus. They were known in the West principally through Knížák's handmade books containing written, typed, painted, drawn, and mimeographed manifestos, drawings, poems, and theoretical writings on performance and other subjects. These books documented the actions and other forms of aesthetic resistance that were prototypes for the collective defiance that spurred the liberation of Eastern Europe in 1989." - Kristine Stiles, Theories and Documents of Contemporary Art (pp. 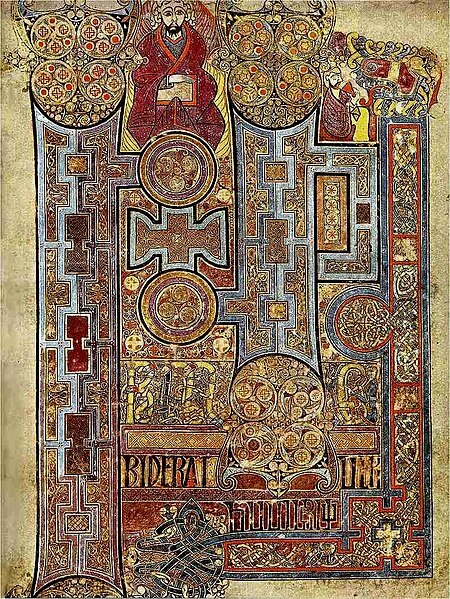 686-7). 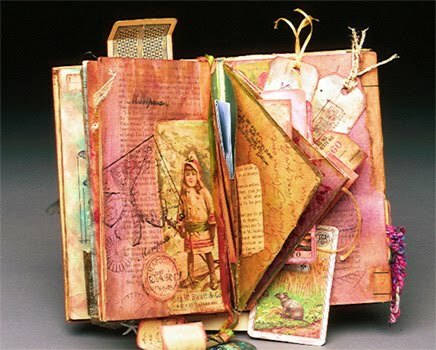 Walker Art Center has posted several original artists' books in its collection online. They can be found here.